There are a few regional design magazines that I always make sure to check out. Atlanta Homes & Lifestyles Magazine is one of those. Southerners just love interiors, so for a single city design mag, AHLM rarely disappoints. Honestly, it’s up there with the big nationals. 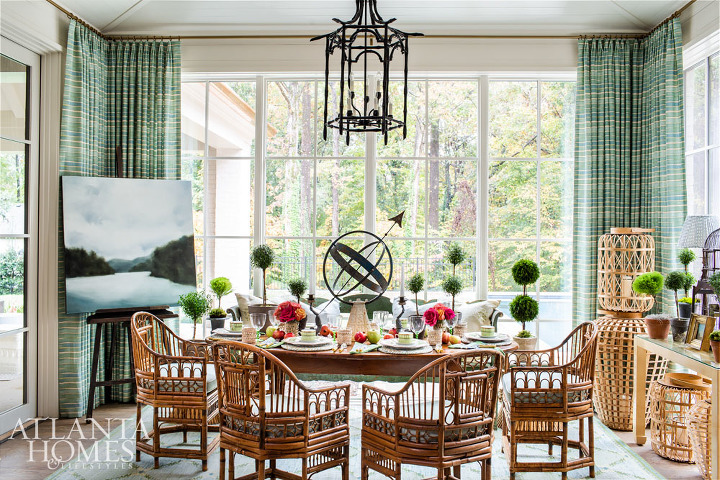 For the last 10 years, the magazine has sponsored the Home for the Holidays Designer Show House benefiting Children’s Healthcare of Atlanta, and each year has topped the previous. And while the holidays are over, those of us not within spitting distance are only seeing the pictures now in this month’s issue. The thing that struck me most was how beautifully layered and livable most rooms were. Rather than being runway-fashion equivalents for Interiors — interesting and thought provoking but not something you’d wear home — the Home for the Holidays designers really created spaces visitors might want for themselves. One thing I love about regional show houses in general is that I always discover designers of whom I was previously completely unaware. Lots of great portfolios in the links below. All photos by Jeff Herr. I know Peter Fasano‘s textiles well, as he’s one of the earlier hand-block-printed textile designers and is located in New England. But I didn’t know Lauren. 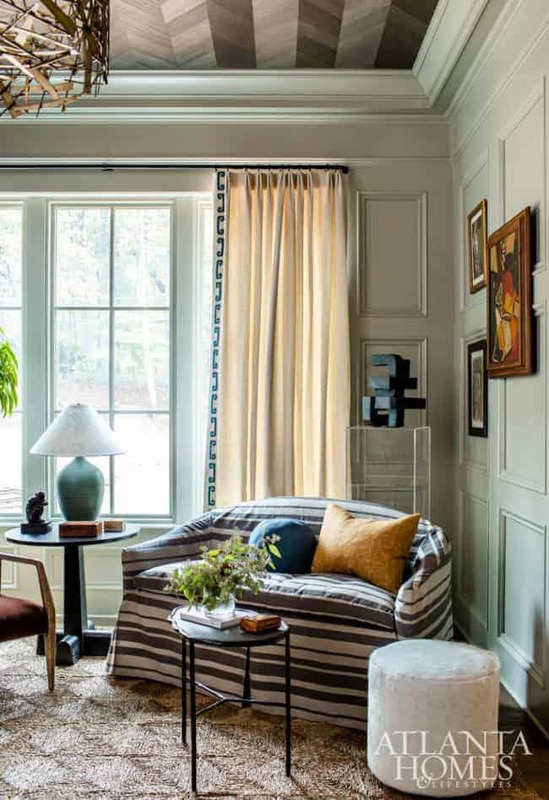 With Sherwin Williams’ warm choice for its 2019 color of the year, everyone is all of a sudden “seeing” a reemergence of warm palettes, but I think, in this case, the trend report is following what is happening in actuality. I think people have gotten tired of cool color schemes and are longing for warmth. Aqua and terra cotta is a gorgeous color combo. But I do have one question — why do fireplaces in the South look so unused? The Thibaut wood veneer ceiling covering is a beaut’ in this textural, masculine space. I’m all about stripes on the horizontal for a there-wasn’t-enough-fabric-to-put-it-vertically-but-I’m-using-it-anyway, devil-may-care feel. The wall color is Sherwin-Williams’ Gateway Gray. Ok, so I lied when I said only “designers of whom I was previously completely unaware.” I’ve known about Margaret Kirkland forever. Her work is just so lovely and liveable. I LOVE her green & blue tribute to Bunny Mellon’s greenhouse on her Virginia estate. Maybe it’s because this winter is New Hampshire has been the worst in the last 7 years. It only gets above 5 degrees when it rains. And if it’s going to rain, you may as well be in the South. The drapery fabric is by Jim Thompson. Who says you can’t do wallpaper two rooms in a row? So pretty. Again, the florals are just killing me in this slop of snow, ice, slush, and fog (5 degrees and 35 mph winds) I’m living in right now. Lauren has such a beautiful, “ladylike” portfolio. Amy Vanderbilt would definitely approve. I adore Gordon Dunning. I’ve featured the Atlanta duo in this post and this post. Frankly, if I’m being honest, I’m a little jealous of how much fun they always look like they’re having together and it makes me want a similarly-quirky partner in decorating crime. This is a lovely room, and I’d never heard of Interior Philosophy before. But my biggest draw for this space is the purple. I’m dying to do purple in a room, but I think New Hampshirites feel purple is only appropriate for Barney. Bobbin turnings are SO New England, so why can’t we get on board with purple????!! I love when a client really goes for art. In this upstairs hallway by Lisa Joublanc art is the be all and end all. She doesn’t overdecorate around it. More purply tones. You can see the rest of the Home for the Holidays Designer Show House here. I’m off for a weekend of cross-country skiing in the fog and ice today. It’s an annual getaway for the HH and me, and even though we’ve had some pretty yucky weather before, this will probably take the cake. Oh well, we don’t only go for the skiing anyway. 🙂 The après ski cheese fondu and hot-tubs-on-the-porch are pretty awesome, too. Meh, maybe we’ll just stay warm and steamy and get chubby on cheese. PS: I’m working on some new exciting material for the blog (How about a tour of the most beautiful marble quarry in America?! Or some frank talk about how much decorating for the long-haul actually costs?) and for extending my services to my readers near and far. Stay tuned! Honey, there’s not one damn thing about those designs that say Southern. Bless their little ole hearts, transplanted yankees trying their best, but they missed it by a mile. As usual, I love your blog posts, and this is no exception! What I really like about the way Southerners decorate is that they have no apologies about using traditional furniture and accessories in new ways. 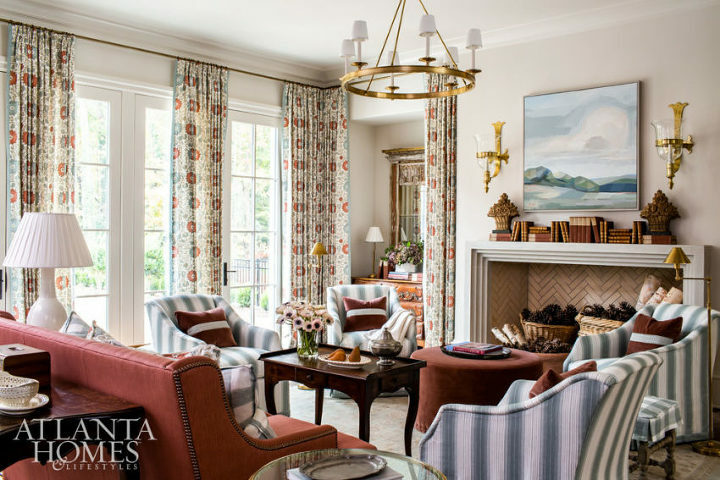 My favorite room is the first one by Lauren Deloach–traditional but fresh with that pretty print on the curtains. I especially love the sconces above the fireplace. These rooms are just beautiful, and I am so happy to see warm colors and tones returning to home interiors. I especially love it when designers find a way to some of both…it brings so much life to rooms!